Metropolitan Toronto is something of a VPN hub these days. We’ve already looked at TunnelBear and recent Symantec acquisition SurfEasy, both based in Toronto. 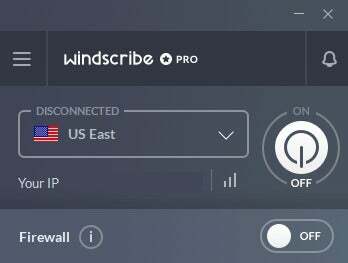 Now it’s time to look at Windscribe, a capable VPN based just outside of Canada’s largest city. In other words, it’s a VPN with ad and tracker blocking and a few extra features that some users might enjoy. Windscribe is another VPN that goes for a simplistic interface on Windows. There are no visual maps to find locations or even a full-panel interface with a list of server locations. Instead, you get a small window with your current suggested location connection (or the last location you connected to), your current IP address, and a big on/off button. You’ll also see something called Firewall. That option is Windscribe’s internet kill switch that automatically cuts your connection when you aren’t connected to the VPN. It’s activated by default when you initiate a VPN connection, but you can turn that off in the app’s preferences. 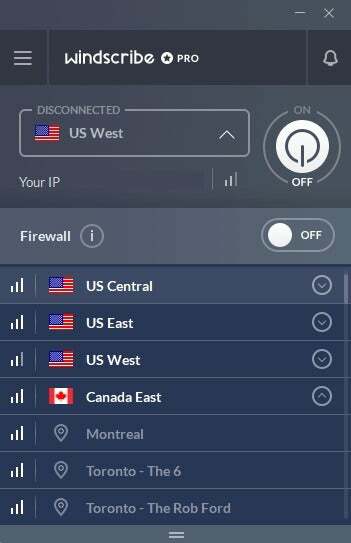 To see Windscribe’s list of locations click on the downward-facing arrow next to your current server location to reveal a single-panel list of Windscribe’s 50 countries. At the top are the American and Canadian locations, followed by the rest. The list isn’t quite organized alphabetically, nor is it organized by continent. First you get most of the European countries organized alphabetically, then a jumble of Asian and middle eastern/north African countries with Russia, Ukraine, and South Africa mixed in, that’s followed by Oceania (Australia and New Zealand), and then South America with Mexico added, because Spanish I guess. It’s a bit of a curious organizational pattern, but not a deal breaker. Clicking on any of these countries will automatically connect you to it. You can also click on the downward arrow on the far right to reveal a list of server locations for each country. Selecting Australia, for example, reveals two possible locations: Sydney - Crocodile and Sydney - Dundee. If you want to get a sense of the response time between your location and the server location, hover over the connectivity icon on the far left of the location list. A small balloon will appear with the ping response time in milliseconds. If a server location isn’t available there will be a little “X” on the icon. One thing I didn’t like about the desktop app is that clicking on the “X” button in the upper-right corner of the window closes the program entirely. With a VPN I prefer the ability to remove it from the taskbar by dismissing the window, but keep it running in the background. Then any time I need to access the interface, I can just open it from the system tray. Windscribe sees its service as being complete when you are using both the Windows desktop app and the browser extension—available for Chrome, Firefox, and Opera. With the browser extension you get the added bonus of ad and tracker blocking, as well as a number of other features, including a nifty link-shortening service that we’ll get to in the next section. As for the extension’s interface, it’s not all that different from what you see on the desktop app. Windscribe’s browser extension provides beta access to U.S. Netflix. 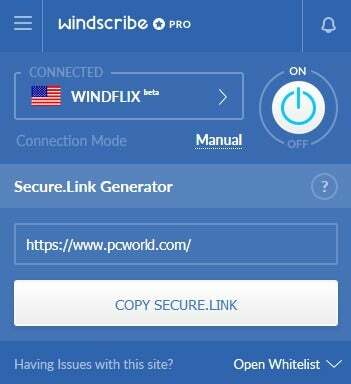 If you’re already using the Windscribe desktop app, there may not seem to be much of a reason to use the browser extension, which uses a proxy service. It does have ad and tracker blocking as previously discussed, but most people use separate extensions for that. One thing Windscribe’s browser extension does have that’s different from the desktop app is access to U.S. Netflix. Using the browser extension, click the location named “Windflix” and you’ll get U.S. Netflix wherever you are in the world. This feature is currently in beta and the company plans to bring it to the desktop app in time. Windscribe allows peer-to-peer file sharing on almost all of its servers. For those where it’s not allowed, you’ll see a small P2P icon with a slash through it to the right of the country name. At this writing, only the India and Japan servers disallowed file sharing. Click on the “hamburger” menu icon in the upper-left corner of the desktop app and select Preferences to get to Windscribe’s settings. Most are pretty straightforward, but under the Share tab you’ll find the ability to turn your PC into a VPN-enabled Wi-Fi hotspot. This feature is currently in “Experimental” mode. There’s also an option to enable a proxy gateway so that devices that normally don’t have VPN access can get it through your PC. This can be helpful for using with smart TVs, game consoles, and set-top boxes. Moving on to the browser add-on we run into a few more helpful features. 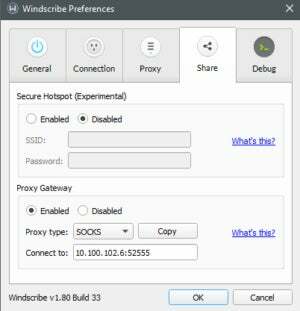 Windscribe’s Secure.link Generator, for example, is a link-shortening service with a security-aware twist. You click on a link and it takes you to a Windscribe landing page at https://secure.link/[shortenedLinkCode]. 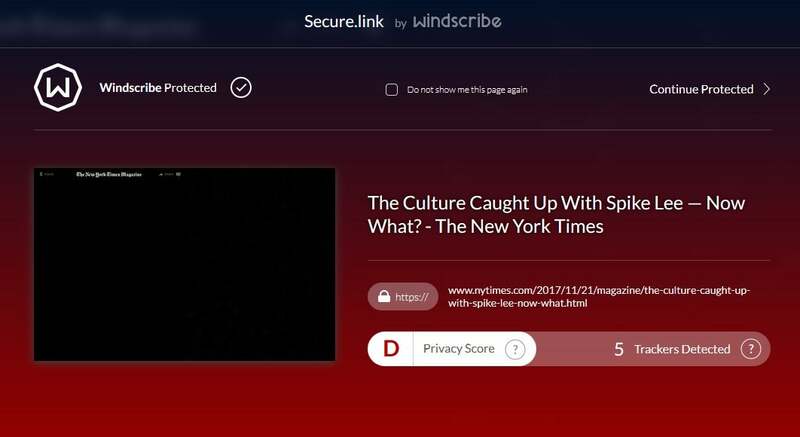 An example of Windscribe’s Secure.link splash page. On the landing page you can see the name of the webpage you’re visiting, how many advertising trackers the page has, and a privacy letter-score rating (A,B,C,D, or F). Continuing to the page with the Windscribe browser extension enabled means all trackers will be blocked—though other extensions such as Privacy Badger and uBlock Origin can do this if you’re sans Windscribe. 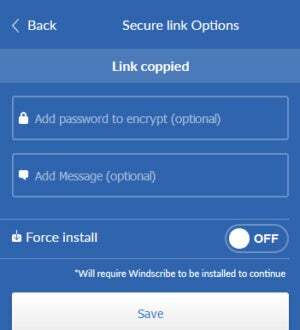 Windscribe’s Secure.link provides encryption and message options. The secure link can also be encrypted with a password, and you can include a message that appears on the landing page. The message can be seen by anyone with the link, but encrypted links can only be opened by users with the appropriate password. There’s also a Force Install option that will require other users to have Windscribe installed before they will be able to see the destination of the link you’ve sent. I wouldn’t recommend using that option. The browser extension in combination with the desktop app makes use of the double-hop feature, where you connect to two different VPN servers—one via the browser and one via the desktop app—for added anonymity online. Keep in mind, however, that double-hop only covers the browser you’re using, not the entire PC. Other VPN services offer a full “double VPN” such as NordVPN. Diving into the extension’s settings via Menu > Privacy Options there are a bunch of features you can activate. There’s Anti-Social, which removes social buttons from the websites you visit. Proxy Time mimics your PC’s time to look like it’s set to the same time as the region you’re connecting to. Split Personality rotates your user-agent profile to avoid tracking through browser fingerprinting, and Cookie Monster destroys all cookies set during a browsing session once a tab is closed. Windscribe is available for PC, Mac, Linux (Ubuntu, Debian, Fedora, and CentOS), Android (phones, tablets, Amazon FireTV, and Nvidia Shield), and iOS, and there’s a setup guide for Kodi. There are also the usual router compatibilities including DD-WRT, Tomato, and an option to buy a pre-configured router. Windscribe is priced at $49 billed annually, or $9 per month. There’s also a free option that limits your location selection to 11, and caps your monthly bandwidth at 10 gigabytes. In our tests, Windscribe scored an average close to 25 percent of the base speed, with particularly standout scores in Europe, good American speeds, and a serviceable Australian connection. That puts Windscribe in “average” territory compared to other VPN services we’ve tested. It’s not faster than others, but its U.S. and European servers are speedy enough to satisfy most users. The company also stores the timestamp of the last time you used Windscribe’s network. This is done to “weed out inactive accounts,” according to the company. Windscribe also logs some other information during your connection including the OpenVPN username, the VPN server you’re connected to, the time of the connection, and the amount of data transferred. This data is kept for up to three minutes after you end your connection session, the company says. The company is relatively open about who is running the service, though you won’t find specific information on the company website. Windscribe is based in Richmond Hill, Ontario. Its mailing address is 9251 Yonge St #8901, Richmond Hill, ON L4C 9T3, Canada. The company’s founders are Yegor Sak and Alex Paguis, as first discovered on LinkedIn. Windscribe accepts payment via credit card, PayPal, Paymentwall, and Bitcoin, allowing for varying levels of anonymity. When you sign up for an account, you can supply just a username—that you create—and password. Windscribe asks for an email address, but you don’t have to provide one—although, without an email address you cannot reset your password. Windscribe is a good VPN service. Its performance is fine, the server network is a little on the small side, but its account creation allows for more anonymity than a lot of services we’ve seen lately—mainly in that it doesn’t require (yet definitely encourages) an email address. It would be even better for anonymity if you could pay in cash, but that’s a rare feature. Bitcoin allows for pseudonymous payment for those who need it. What really sets Windscribe apart, however, are the extras such as the Secure.link Generator that helps take the guessing out of where a shortened link is sending you—though some may not appreciate the extra landing page. The various other privacy options in the browser add-on are also a nice touch. The Windflix feature is also helpful for those planning an overseas trip—though keep in mind Netflix could gain the upper hand in this cat-and-mouse game at any time. 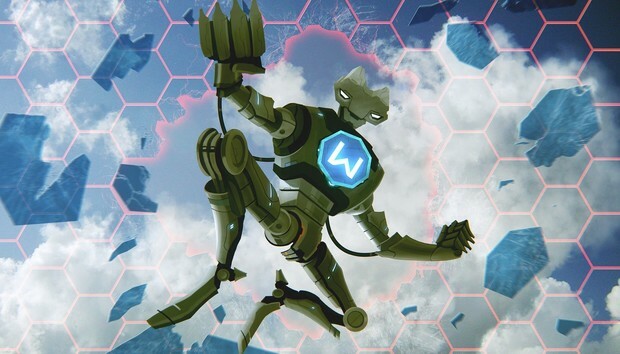 As long as you don’t mind the various logging policies Windscribe is well worth a look.